We want to learn and to share. We want to be heard and not talked at. We want to network - and better if we can do it in engaging and unique spaces. And did I mention, we also want to have our coffee outside of the official breaks too. "Turning exhibition halls into networking hubs and giving companies much more freedom about how they profile themselves in such an environment is a welcome move away from tradition. Such a central gathering point also lends itself to small sessions such as problem-based learning discussions," says Jan Tonkin, president, IAPCO and managing director, The Conference Company, New Zealand. These shifting preferences reflect the current wants of delegates who desire a more dynamic and interactive ambience at conventions and exhibitions. This places the onus on planners and organisers to create programme designs and formats that are different and even unconventional. V Conference Malaysia is a five-day conference by QNET, a Malaysian direct selling company, it is the largest incentive-based conference in Malaysia and attracted 15,500 attendees from over 50 countries. It has been held in Setia SPICE for five consecutive years. Flexibility was key in planning the space and layout for the conference. A stage was set up in the middle of the Arena for impact during presentations, and allowing seating for 15,300 pax. Displays and activities were set up at The Concourse on level 3, while the Convention Centre was used for registrations and exhibition booth set-ups. Accommodating such a high number of attendees required smart space planning to ensure everyone experienced the programme highlights well. 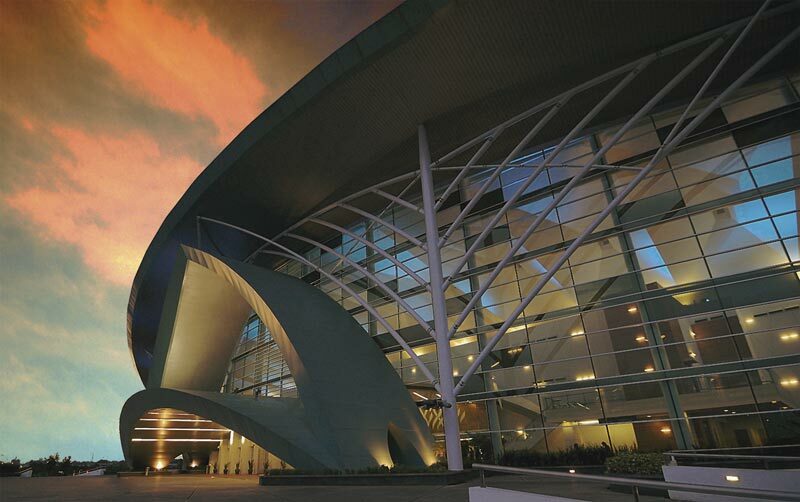 The Arena and Convention Centre served that purpose and also facilitated a seamless flow via a covered walkway. It was a large-scale event of international proportions that drew much attention with its live broadcast, and high-tech audiovisual elements made for a dramatic and colourful experience. Visitor experience will be the key focus with EXPOtainment initiatives to make the customer journey interactive and engaging. This EXPOtainment programme aims to combine expo with entertainment activities and it will potentially include F&B, transportation and other customer-oriented services. 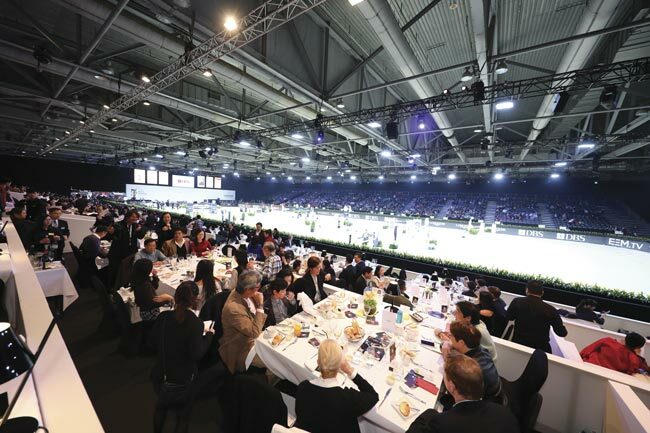 Asia Horse Week's inaugural conference was introduced by Longines Masters of Hong Kong, the only international five-star equestrian event in Asia, which debuted in AWE and has been running for six years. Sharing sessions were scheduled tactically between the intervals of show jumping programmes. It encouraged active participation at the seminar (Asia Horse Week), followed by action-packed entertainment from exciting competitions (Longines Masters of Hong Kong), engaging live music, delightful gourmet to shopping fun at the prestigious retail village across the 270,000 sq ft venue. Captions: VIP guests enjoying the equestrian performance at a Longines Masters Hong Kong event. AWE's Venue Service Planning & Delivery team worked seamlessly with the event organiser, especially on hygiene and sound insulation issues to ensure the horse stable, show jumping area, seminar area and other entertainment zones were perfectly integrated without any conflict. BCCK has ramped up the speed of business Wi-Fi to one gigabit per second (Gbps). It was purpose-built to support 13,000 concurrent devices on level one and two of the centre, allowing continuous streaming without interruption. 13th World Islamic Economic Forum 2017 was organised by the WIEF Foundation. The three-day event gathered numerous leading global government leaders, captains of industries, academicians and professionals from around the world. It was attended by 2,000 delegates. Due to its rainforest theme and oval architecture, the venue allows for all activities and programmes to be centred within one area. All participants had easy access to the halls and meeting rooms rendering the smooth flow of participants from one room to another, said organiser executive director and chief financial officer Jackie Mah. Mah shared that the team was always prepared to go beyond their means to accept negotiations on certain terms without compromising on the policies of the centre. They also provided luxury toilets for VVIPs upon request. Food wise, the chefs and support staff made extra efforts to perfect the menu - from ingredient selection to presentation. The ambience of Sarawak's cultural diversity was felt throughout the event, with the presence of the Sarawak pavilions, local cuisines, handicraft display, artistic performances and colourful displays of traditional costumes. Even the roof of BCCK is shaped in the form of a 'ririk' leaf, a rainforest plant that plays an important role in the local indigenous culture, said Mah. 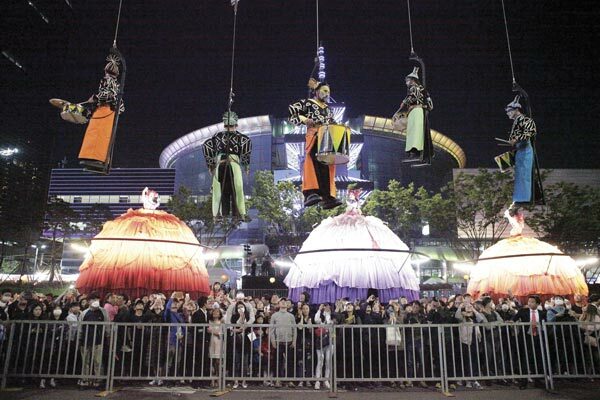 A theatrical performance at C-Festival that makes use of the outdoor space at Coex. Digital signage is one of the big developments at COEX, with each of the 12 meetings rooms featuring an LED display. Making an impact is the SMTOWN Coex Artium performance hall, which now boasts South Korea's largest LED display spanning 1,620 sqm. The conference area has also been renovated and features the ASEM Ballroom for up to 900 pax. C-Festival 2018 is South Korea's largest urban culture festival, attracting 1.7 million visitors last year and utilising three halls and outdoor space. 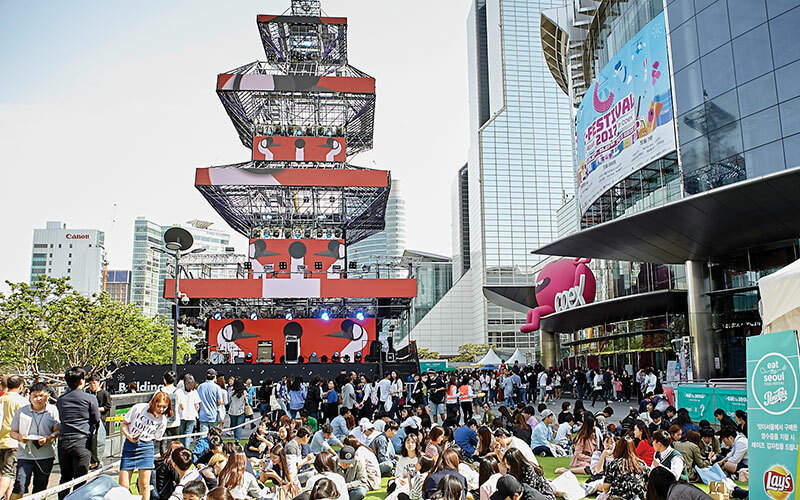 To make Coex more relevant to the public, Coex comes up with a new theme for each year's C-Festival, complete with sub-events that connect local and global cultures. 2018's C-Festival will include performances by K-pop stars and indie musicians from around the world. The C-Festival at Coex appeals to the community, attracting 1.7 million visitors last year. In addition to traditional exhibition booths inside the centre, the outdoor grounds were also used for concerts, demonstrations, food trucks, and more. 2017's event also featured a major parade along the bustling Yeongdong-daero street next to Coex. By appealing to visitors of all ages with activities for children, youths, and adults, the festival is able to consistently draw participation from a variety of organisations including embassies, corporate brands, tourism organisations, and even small and medium enterprises. ICE features 10 exhibition halls of 50,000 sqm and 4,000 sqm of convention hall space, supported by world-class F&B services that includes an in-house kitchen for seamless catering functions. Gaikindo Indonesia International Auto Show (GIIAS) is the biggest auto show in Southeast Asia. It took up 10 exhibition halls and the convention centre, including the main convention hall and 33 meeting rooms. Utilising an exhibition space of more than 80,000 sqm, the planning for visitor flow had to be well thought out. The event had the highest visitor numbers at ICE, hitting more than 500,000 visitors during the 11-day affair. GIIAS transformed the 35,000 sqm outdoor parking area of ICE into a car test drive area that accommodated almost all the participating car brands for their test drive sessions. The halls in Taipei Nangang Exhibition Center had to be constantly reconfigured for different type of sports. With the new Intelligent Visitor Entry System at Taipei Nangang Exhibition Center Hall 1, attendees can obtain admission tickets via self-check-in kiosks and enter via automated gantries, while event organisers collect specific visitor data for analysis. Planners can also go on a virtual reality site inspection of Nangang Exhibition Center, with the same available technology for Hall 2 once it opens in March 2019. Taipei 2017 Summer Universiade s a global sports tournament spread over 12 days. 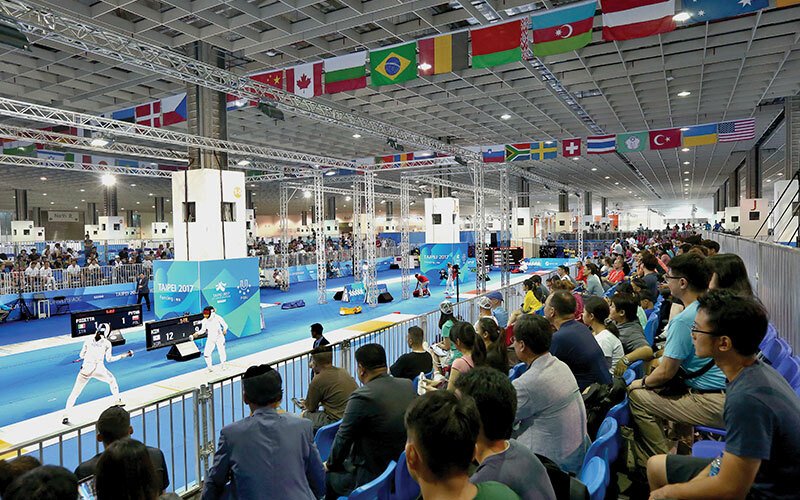 Besides adding new flooring and lighting systems to the centre's first and fourth floor exhibition halls, the venue also underwent several intensive test tournaments to ensure they met the FISU's (International University Sports Federation) competition standards. Throughout the 12-day games, the venue's management team also worked closely with the games' organising committee and equipment suppliers to constantly adjust the halls for dozens of events across five different sports, including fencing and gymnastics. Even though it was the first time the centre had hosted a sporting event, it won the praise of foreign sports officials, some of whom called it "the best fencing venue" the Universiade has seen since year 2000. Kyoto International Conference Center (ICC Kyoto) is expecting to launch its new hall in the last quarter of the year. It will showcase a 2,000 sqm multi-purpose space and accommodate up to 2,500 attendees. Built adjacent to the existing event hall, the new hall will create a seamless 5,000 sqm venue on the same floor for more than 4,000 attendees. The reception for the International Photography Festival welcomed 500 guests comprising VIPs, sponsors, partners, artists and performers. Special lighting using air-inflated balloons and LED lights enhanced the mood by lighting up the pillars and other building elements. There was also a live performance incorporating the guitar and the tsugaru-jamisen, a three-stringed instrument used for traditional music. For the corporate event, fireworks released from the adjacent lake gave a dramatic flair to the evening, while 3D mapping and laser beams projected onto the façade of ICC Kyoto gave an artistic yet high-tech feel to the ambience. Refurbishment works on all 2,561 rooms and suites were completed end-2017. New restaurants to the integrated resort include The Bird Southern Table and Bar and LAVO Italian Restaurant and Rooftop Bar, with New York-based restaurant Black Tap Craft Burgers & Beer to open in Q3 this year. Global Leadership Conference and YPO EDGE 2018 sees the world's largest gathering of chief executives each year convening on key issues in business, politics, science, technology, philanthropy and the humanities. Themed "Defy Convention", the five-day event was spread out across a diverse range of venues from large ballrooms and meeting rooms to private restaurant venues and spaces. 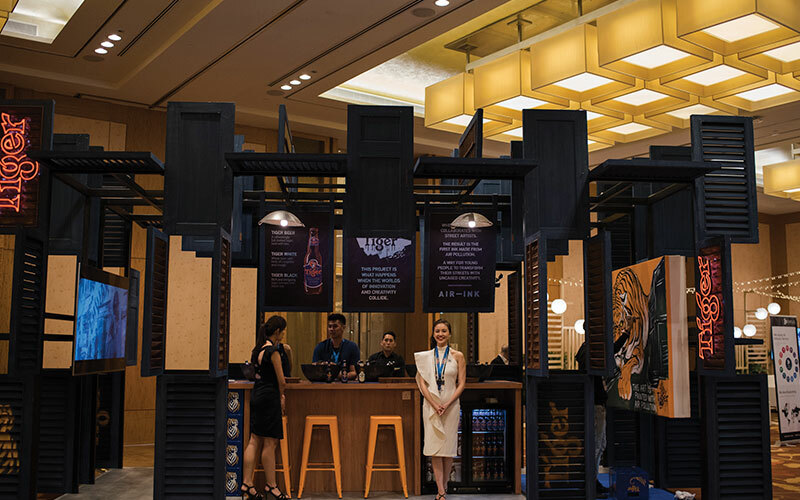 For delegates, personal touches customised for the event include a dedicated check-in counter for YPO attendees, special retail experience at The Shoppes and customised on-property branding for YPO during the event week. For its VIP group, no effort was spared; MBS had a red carpet arrival experience specially organised. Green initiatives such as water dispensers, recycling areas for plastic, glass and paper and the diversion of leftover food to onsite food waste digesters were incorporated into YPO for the first time. Another new conference element was a mobile app that engaged delegates with features such as real-time polling. IL Prato offers a unique venue with its spacious outdoor event lawn for up to 5,000 delegates. Located adjacent to The Venetian Macao and The Parisian Macao, it is ideal for cocktail-style events and team building activities. For memorable stays, the new Champagne Suite category at The Parisian Macao offers a luxurious experience. Dimension Data Asia Pacific Sales Conference held at The Parisian Macao attracted 460 international delegates. It featured meetings and conference sessions, an outdoor cocktail reception and a gala dinner in the ballroom. Occupying the entire 3,400-sqm Parisian Ballroom, conference delegates enjoyed privacy with exclusive use of the ballroom foyer. The meetings facilities were on one level, making it easy for organisers and delegates to navigate between venues, with shopping, dining and entertainment all under one roof. The organiser was particularly impressed with the flexibility of the venue. Within short notice, the Conference & Exhibition team at The Parisian Macao was able to turn the meeting space into an awards dinner venue. "We were extremely impressed with the hotel management and service - from sales negotiation to conference organisation and dining. 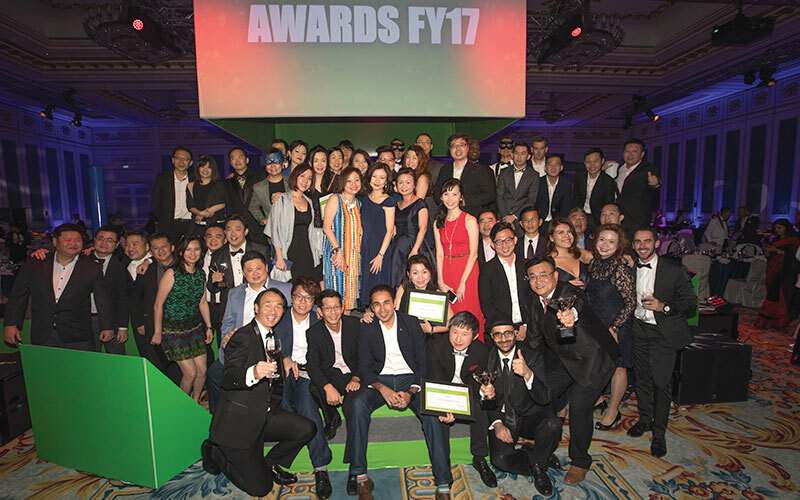 Not to mention the smooth and very hospitable experience with the front office, guest relations and transportation teams," says Esther Quah, corporate communications and marketing director of Dimension Data Asia Pacific. The Parisian Macao pool deck space, which can comfortably host 500 delegates, was a popular venue for welcome cocktails, and with the Eiffel Tower in the backdrop, many memorable photo opportunities were taken.